Neonicotinoid insecticides are highly water soluble, and plants can absorb them and move them through their “circulatory system” from the root zone up into leaves and other tissues. 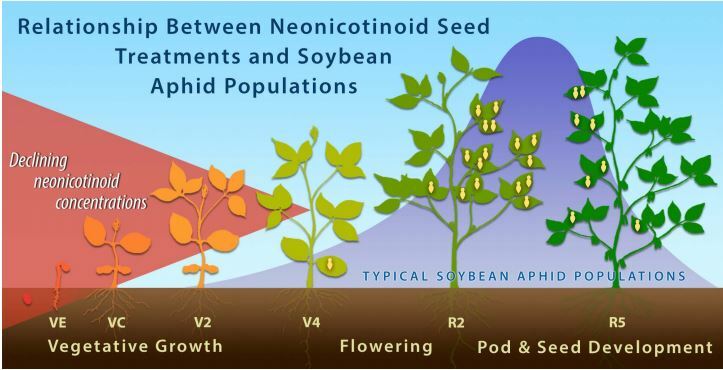 This quality has made neonicotinoids a popular insecticidal seed treatment of many crops (Figure 1). In 2011, more than 80 percent of corn, more than 50 percent of cotton, and about 40 percent of soybean acres were planted with neonicotinoid-treated seed, a total area described as “roughly the size of California.” (Douglas and Tooker 2015). Neonicotinoid seed treatments of soybean rank only behind corn in total acreage. Figure 1. Neonicotinoid-treated soybean seed before soil covering. Do Neonicotinoid Seet Treatments Work in Soybean? Neonicotinoid seed treatments offer soybean plants a narrow window of protection — a maximum of three weeks after planting (McCornack and Ragsdale 2006). As such, they can be useful for managing early-season pests in targeted, high-risk situations. Fields transitioning to soybean production from pasture, Conservation Reserve Program (CRP) land, or grassland to soybean production. Such fields tend to have higher populations of longlived soil pests, such as wireworms or white grubs, which cannot be controlled with foliar insecticides. Fields with recently incorporated animal manure, green cover crops, or weeds. These fields tend to be more attractive to seedcorn maggot, because females lay eggs in rotting organic material. Second (double) crop or specialty (food-grade or seed) soybean. During soybean aphid outbreaks, aphids may migrate from mature soybean plants to colonize later-planted plants in a double-crop situation. In food-grade or seed soybean, earlyseason insect pests can vector diseases that affect crop quality. For example, bean leaf beetle transmits bean pod mottle virus. These high-risk scenarios are uncommon in northern states. 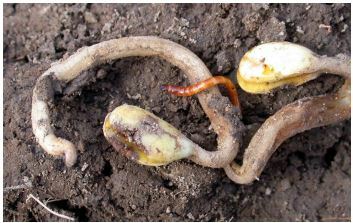 Seed and seedling pests such as wireworms, white grubs, and seedcorn maggots rarely reach economically damaging levels in the vast majority of soybean fields (Figure 2). Adult bean leaf beetles are frequently encountered in newly emerged soybean, but they rarely cause more than cosmetic injury to plants (Figure 3). 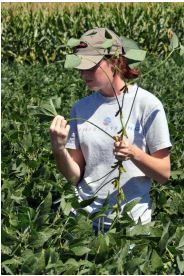 It is critical to remember that soybean plants are resilient and can tolerate considerable early-season damage without suffering economic loss. Figure 2. Wireworm feeding seldom reaches economically damaging levels. Recent field studies support this point: yield benefits attributed to neonicotinoid seed treatments are inconsistent or absent (Seagraves and Lundgren 2012; Gaspar et al. 2014, 2015). The U.S. EPA extensively reviewed published and unpublished data regarding the yield benefits and concluded that “neonicotinoid seed treatments likely provide $0 in benefits to growers” (USEPA 2014). Figure 3. Early-season bean leaf beetle feeding on untreated soybean seedlings (left) and on neonicotinoid seed-treated seedlings (right). This minor feeding does not reduce yield. Soybean aphid is the most important insect pest of soybean in northern states, and it is listed on labels for neonicotinoid seed treatments. Recall that neonicotinoid seed treatments protect soybean seedlings for a short time window after planting (approximately three weeks). However, soybean aphid populations usually increase in midsummer during the late-vegetative and bloom stages of soybean (Hodgson et al. 2005, Ragsdale et al. 2007). In other words, populations increase to threshold levels weeks after the short window that neonicotinoid seed treatments protect plants (Figure 4). A suite of predators and parasitoids (Figure 5) frequently suppress early-season aphid infestations before they reach threshold levels (Rutledge et al. 2004, Yoo and O’Neil 2008). Research has repeatedly demonstrated that following the well-established and widely implemented treatment threshold of 250 or more aphids per plant to time foliar insecticide applications remains the most effective and economical approach for soybean aphid management (Ragsdale et al. 2007, Johnson et al. 2009, Song and Swinton 2009). Figure 4. The relative concentration of the neonicotinoid thiamethoxam (the active insecticidal ingredient in CruiserMaxx® seed treatment) decreases rapidly after planting (represented by the red triangle). There is little or no insecticide remaining in soybean plants by the time soybean aphid populations typically begin to increase (represented by the purple-blue curve). Figure 5. 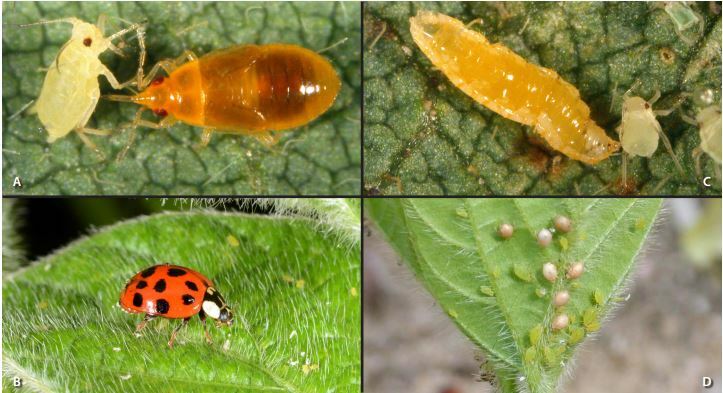 Predators, such as (A) an Orius nymph, (B) Asian lady beetle, (C) aphid midge larva, and (D) parasitic wasps typically suppress early-season infestations of soybean aphid. To summarize: For typical field situations, independent research demonstrates that neonicotinoid seed treatments do not provide a consistent return on investment (Hodgson and VanNostrand 2012, 2013, 2014; Seagraves and Lundgren 2012; McCarville et al. 2014). The current use of neonicotinoid seed treatments in soybean and other crops far exceeds pest pressures. Neonicotinoid seed treatments pose risks to non-target organisms in two main ways: off-target movement and environmental persistence. In target pest populations , neonicotinoid seed treatments pose the threat of resistance development. Planter dust, which is generated during and shortly after planting neonicotinoid-treated seeds, contains high concentrations of neonicotinoid insecticides (Figure 6). Dust can move beyond field margins and land on flowers and other vegetation and potentially expose non-target insects (including honey bees and other pollinators) (Krupke et al. 2012, Stewart et al. 2014, Krupke and Long 2015). Neonicotinoids are highly soluble in water, which facilitates movement beyond field borders via tile drainage and runoff. Studies also show that neonicotinoid contamination in water bodies has a negative effect on arthropod communities, which are the bases of local food webs (van Dijk et al. 2013, Hallmann et al. 2014, Hladik et al. 2014, Main et al. 2014). Neonicotinoid residues from seed treatments may be found in the soil for months or even years after planting (USEPA 2003, Bonmatin et al. 2014). Researchers are currently exploring the possible effects of these residues. There is evidence that neonicotinoid residues disrupt biological control (Seagraves and Lundgren 2012, Douglas et al., 2014) or may be absorbed by the host plants of other insects, including milkweed (Figure 7), the food source for monarch butterfly caterpillars (Pecenka and Lundgren 2015). Neonicotinoids can also make other organisms toxic. This phenomenon was documented in slugs, which are not sensitive to neonicotinoids, but ingest them when they feed on plants grown from treated seeds. When these “toxic” slugs are attacked by ground beetles, their principal natural enemies (Figure 8), the insecticide passes to the predator, disrupting biological control of the slugs and lowering yield (Douglas et al. 2015). The same study demonstrated that in slug-infested fields, soybean grown without neonicotinoid seed treatments produced higher plant populations and yields than their treated counterparts. 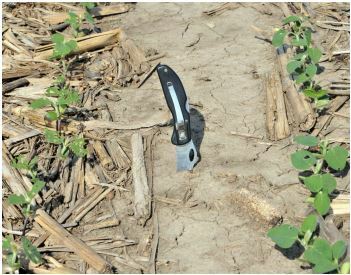 This study has important management implications, since slugs are emerging as a key pest in no-till cropping systems in many parts of the northern soybean production region. Figure 6. (A) Planter dust generated when planting treated seed contains a very high concentration of neonicotinoids that (B) can move off-target, and (C) potentially harm beneficial organisms. Figure 7. 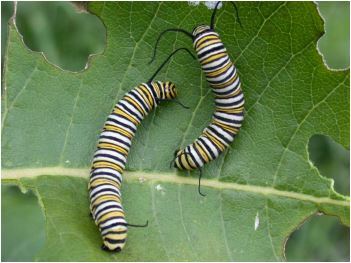 Non-target plants (such as milkweed) can absorb neonicotinoid residues and affect non-target insects (such as monarch butterfly caterpillars). Figure 8. 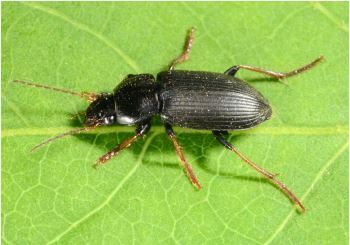 Ground beetles typically control slug populations. But slugs that feed on plants grown from neonicotinoid-treated seeds can pass the insecticide to the beetles. Resistance is a potential consequence of consistent exposure to any pesticide. When growers repeatedly plant neonicotinoid-treated seeds in fields where no economic levels of target pests occur, the rate at which resistance will occur accelerates. In addition, foliar neonicotinoids applied to soybean during the season will further increase pressure on pests to evolve resistance. Researchers have documented neonicotinoid resistance in several key pest species in other cropping systems (Bass et al. 2015). Most insect pests of soybean have wellestablished scouting guidelines and thresholds (Figure 9). Specific recommendations are available from university extension service websites and publications (consult your state extension service). When pest problems occur, the best management is based on an integrated approach that can include rotating crops, conserving natural enemies, using soybean varieties with resistance to pests (soybean aphid) or disease (bean pod mottle virus), and scouting and applying insecticides at established thresholds. Figure 9. Scouting for insect pests is the tried and true approach. Scouting and selectively using any insecticide (including neonicotinoid seed treatments) offers the long-term benefit of extending the useful lifespan of that product. Selective use also reduces short-term production costs. Growers frequently face limited choices regarding seed treatments. Popular soybean varieties are often offered only with a pre-applied package of seed treatments. 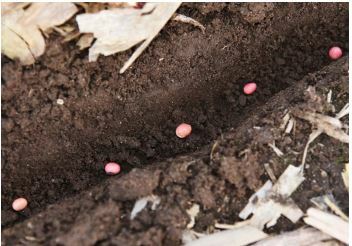 Growers who desire untreated soybean seed, or seed treated only with fungicides, should let their seed dealers know as early as possible when ordering seed for the next growing season. Bass, C., I. Denholm, M.S. Williamson and R. Nauen. 2015. The global status of insect resistance to neonicotinoid insecticides. Pesticide Biochemistry and Physiology. DOI:10.1016/j. pestbp.2015.04.004. Bonmatin, J.-M., C. Giorio, V. Girolami, D. Goulson, D.P. Kreutzweiser, C. Krupke, M. Liess, E. Long, M. Marzaro, E.A.D. Mitchell, D.A. Noome, N. Simon-Delso, and A. Tapparo. 2014. Environmental fate and exposure; neonicotinoids and fipronil. Environmental Science and Pollution Research. DOI: 10.1007/s11356-014-3332-7. Douglas, M.R. and J.F. Tooker. 2015. Large scale deployment of seed treatments has driven rapid increase in use of neonicotinoid insecticides and preemptive pest management in US field crops. Environmental Science and Technology. DOI: 10.1021/es506141g. Douglas, M.R., J.R. Rohr, and J.F. Tooker. 2014. Neonicotinoid insecticide travels through a soil food chain, disrupting biological control of non-target pests and decreasing soybean yield. Journal of Applied Ecology. DOI: 10.1111/1365- 2664.12372. Gaspar, A.P., D.A. Marburger, S. Mourtzinis and S.P. Conley. 2014. Soybean seed yield response to multiple seed treatment components across diverse environments. Agronomy Journal 09/2014; 106(6):1955-1962. DOI:10.2134/agronj14.0277. Gaspar, A.P., P.D. Mitchell and S.P. Conley. 2015. Economic risk and profitability of soybean fungicide and insecticide seed treatments at reduced seeding rates. Crop Science 01/2015; DOI:10.2135/cropsci2014.02.0114. Hallmann, C.A., R.P.B. Foppen, C.A.M. van Turnhout, J. de Kroon, and E. Jongejans. 2014. Declines in insectivorous birds are associated with high neonicotinoid concentrations. Nature. 511: 341-344. Hladik, M.L., D.W. Kolpin, and K. Kuivila. 2014. Widespread occurrence of neonicotinoid insecticides in streams in a high corn and soybean producing region, USA. Environmental Pollution. 193: 189-196. Hodgson, E.W., R.C. Venette, M. Abrahamson, and D.W. Ragsdale. 2005. Alate production of soybean aphid (Homoptera: Aphididae) in Minnesota. Environmental Entomology. 34: 1456-1463. Hodgson, E.W., and G. VanNostrand. 2014. 2014 Yellow Book Report of insecticide evaluation for soybean pests, 21 pp. Department of Entomology, Iowa State University, Publication 296-14. Hodgson, E.W., and G. VanNostrand. 2013. 2013 Yellow Book Report of insecticide evaluation for soybean pests, 25 pp. Department of Entomology, Iowa State University, Publication 294-13. Hodgson, E.W., and G. VanNostrand. 2012. 2012 Yellow Book Report of insecticide evaluation for soybean pests, 35 pp. Department of Entomology, Iowa State University, Publication 291-12. Johnson, K.D., M.E. O’Neal, D.W. Ragsdale, C.D. DiFonzo, S.M. Swinton, P.M. Dixon, B.D. Potter, E.W. Hodgson, and A.C. Costamagna. 2009. Probability of cost-effective management of soybean aphid (Hemiptera: Aphididae) in North America. Journal of Economic Entomology. 102: 2101-2108. Krupke C.H., G.J. Hunt, B.D. Eitzer, G. Andino and K. Given. 2012. Multiple routes of pesticide exposure for honey bees living near agricultural fields. PLoS One 7: e29268. Main, A.R., J.V. Headley, K.M. Peru, N.L. Michel, A.J. Cessna, and C.A. Morrissey. 2014. Widespread use and frequent detection of neonicotinoid insecticides in wetlands of Canada’s prairie pothole region. PLoS One. DOI: 10.1371/journal. pone.0101400. McCarville, M.T., M.E. O’Neal, B.D. Potter, K.J. Tilmon, B.P. McCornack, J.F. Tooker, and D.A. Prischmann-Voldseth. 2014. One gene versus two: A regional study on the efficacy of single gene versus pyramided resistance for soybean aphid management. Journal of Economic Entomology. 107: 1680-1687. McCornack, B.P., and D.W. Ragsdale. 2006. Efficacy of thiamethoxam to suppress soybean aphid populations in Minnesota soybean. Crop Management. DOI: 10.1094/CM-2006-0915-01-RS. Pecenka, J.R., and J.G. Lundgren. 2015. Non-target effects of clothianidin on monarch butterflies. Science of Nature. 102: 19. Ragsdale, D.W., B.P. McCornack, R.C. Venette, B.D. Potter, I.V. MacRae, E.W. Hodgson, M.E. O’Neal, K.D. Johnson, R.J. O’Neil, C.D. DiFonzo, T.E. Hunt, P.A. Glogoza, and E.M. Cullen. 2007. Economic threshold for soybean aphid (Hemiptera: Aphididae). Journal of Economic Entomology. 100: 1258-1267. Rutledge, C.E., R.J. O’Neil, T.B. Fox, and D.A. Landis. 2004. Soybean aphid predators and their use in integrated pest management. Annals of the Entomological Society of America. 97: 240-248. Seagraves, M.P., and J.G. Lundgren. 2012. Effects of neonicotinoid seed treatments on soybean aphid and its natural enemies. Journal of Pest Science. 85: 125-132. Song, F., and S.M. Swinton. 2009. Returns to integrated pest management research and outreach for soybean aphid. Journal of Economic Entomology. 102: 2116-2125. Stewart, S.D., G.M. Lorenz, A.L. Catchot, J. Gore, D. Cook, J. Skinner, T.C. Mueller, D.R. Johnson, J. Zawislak, and J. Barber. 2014. Potential exposure of pollinators to neonicotinoid insecticides from the use of insecticide seed treatments in the Mid-Southern United States. Environmental Science & Technology. 48(16): 9762-9769. [USEPA] United States Environmental Protection Agency, Office of Pesticide Programs. 2003. Factsheet Clothianidin. EPA Publication 7501C; www.epa.gov/pesticides/chem_search/reg_actions/registration/fs_PC-044309_30-May-03. pdf#_ga=1.133079692.360028879.1443119586. [USEPA] United States Environmental Protection Agency, Office of Chemical Safety and Pollution Prevention. 2014. Benefits of neonicotinoid seed treatments to soybean production. http://tinyurl. com/o29umwf. van Dijk, T.C., M.A. van Staalduinen, and J.P. van der Sluijs. 2013. Macro-invertebrate decline in surface water polluted with imidacloprid. PLoS One. DOI: 10.1371/journal.pone.0062374. Yoo, H.J.S., and R.J. O’Neil. 2009. Temporal relationships between the generalist predator, Orius insidiosus, and its two major prey in soybean. Biological Control. 48(2): 168-180. Learn more about insect pests of soybean from your state’s extension service. Reference in this publication to any specific commercial product, process, or service, or the use of any trade, firm, or corporation name is for general informational purposes only and does not constitute an endorsement, recommendation, or certification of any kind by authors or their institutions. Individuals using such products assume responsibility for their use in accordance with current directions of the manufacturer. This publication is available from the state extension services that contributed to this publication. It also is available from the Purdue Extension Education Store, edustore.purdue.edu.